The Empordà incoming agency Fil Mediterranean Travel Designers has three recent experiences to tell us about involving new technology companies that selected the Costa Brava and Girona Pyrenees as the destination for their events. An important transfer booking system platform which operates worldwide and has its headquarters in the Empordà invited almost 80 of its collaborators to the unique venue of La Farinera Sant Lluís to celebrate the company’s tenth anniversary. The multicultural, highly dynamic group tucked into the barbecue lunch with live background music and built up their energy for the subsequent activities organised by Ocitània. The old flour mill’s five-hectare estate in the idyllic surroundings of Pont de Molins was the perfect setting for them to take part in laser tag, archery, rides on Segways, hover boards (electric scooters) and Giracats (mono cycles) and teambuilding games. 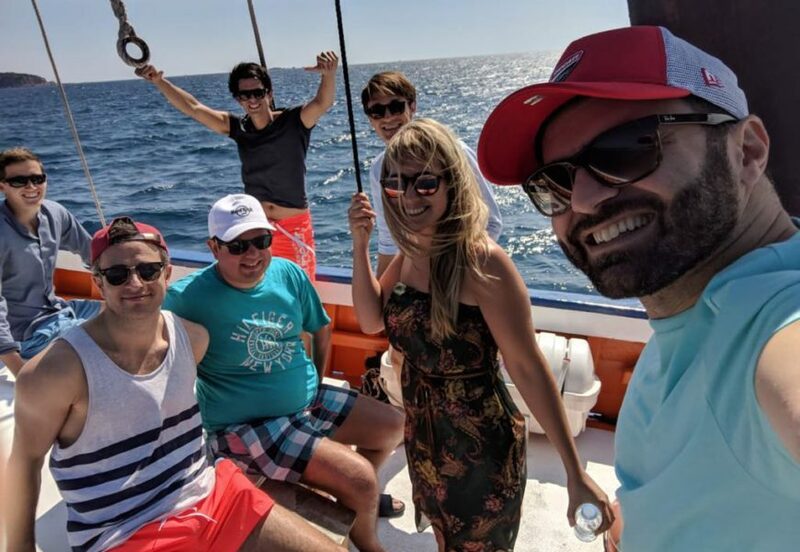 During their incentive stay in Begur, the team made up of employees from the Amsterdam and Barcelona offices of a company that develops and manages a successful designer clothing swap mobile app hired what is a very common service among our MICE clientele: a tour of the Costa Brava in Tela Marinera’s traditional Catalan wooden boats. It is slightly less usual, however, for the sailors to hold their meeting on board during the trip. On this occasion, the historical wooden boat Rafael was the unusual venue for a work session, although, of course, it did end up with a refreshing dip. A hundred employees from a French online course platform stayed at Hotel Peralada Wine Spa & Golf for their annual meeting. On the day of their arrival, after supper,Hotel Peralada Wine Spa & Golf had the Casino & Team Building activity ready for them, based on the highly appropriate theme of big gaming rooms. The second day revolved around a seaside atmosphere and open spaces. In L’Escala they were given the choice of all sorts of water sports organised by the local sailing club. After a busy morning of sailing, SUP, snorkelling and beach games, they had lunch at the same sailing club before carrying on with their work in the afternoon and having supper at the Beach Club in Roses. On the last day, a beach barbecue party held in the heart of the Aiguamolls de l’Empordà Natural Park provided the perfect end to three very full, experience-packed days.